Only…I wish they weren’t liars. 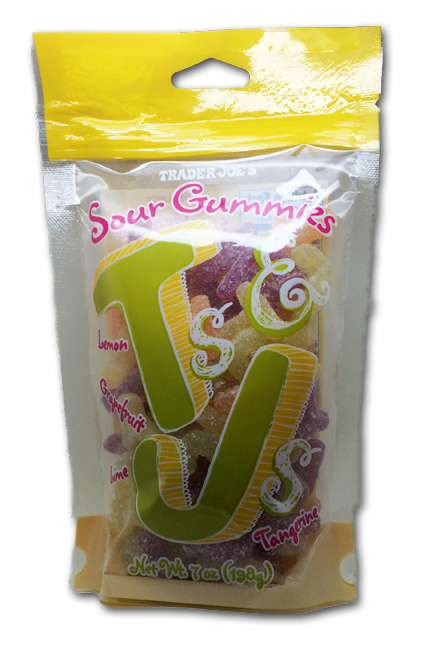 These aren’t gummies. As the ever-astute Cybele pointed out in her review, these are actually jellies. That shouldn’t raise anyone’s cockles, because jellies are freakin’ awesome. These however, are sticky as all get out. We’ve talked a bit about toothstick® in these parts, but let me recap: if candy that sticks to your teeth bothers you, then you can stop reading here. If you do stop though, you’ll be missing out on some of the most delicious candies I’ve tried in a while. There’s only two shapes here: a “T” and a “J”. If anyone understands why they only have these two letters, please let me know, it’s been confounding me. The flavors, as I was alluding to before, are spot on and absolutely delicious. We get tangerine, lemon, lime & grapefruit-four fruits that are tart to begin with, nice touch. 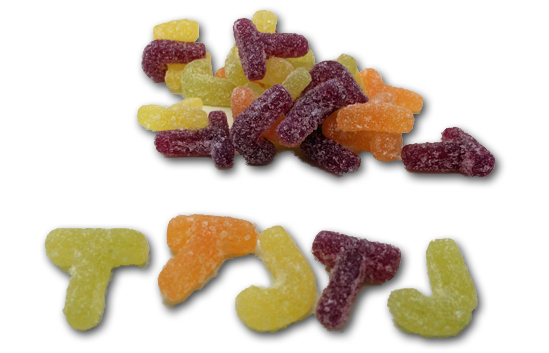 But they’re so much more than sour, they’re just perfect renditions of the flavors. Honestly, these candies are so tasty, they’d be at the top of my charts if it weren’t for the obscene toothstick level. Every time I go for them, even without thinking about it, as I bite into them, I get a bit disappointed-and this is from a jelly candy psycho fan. Is it worth it though? Yeah, it is. But let me close out with this: if these were just a bit firmer of a jelly with just a touch less stick, these would be a 5 star Editors Choice, always throw in my cart kind of thing. As they exist currently, they’re just a damn good occasional treat.